KEDVII 1908 issue 1d, 2d. KEDVII 1908 issue 1d R4, 2d R4. Background: Pike Brothers Limited were established in the 1890’s in Brisbane and by the turn of the century they had premises at 30-32 Queen Street and were growing along side other perfin using retail clothiers and Department Stores such as Finneys, T C Bernie and Stewart and Company. Later they moved to larger premises at 85-91 Queen Street and from here they supported an extensive mail order clothing business. In addition they had other retail outlets in Townsville and Toowoomba. They list a London location in some of their advertisements but this was most likely a buying office. Device: The PBLTD was a single head device and I caution collectors about previous published images which have been of a poor quality and not representative of the true pattern. 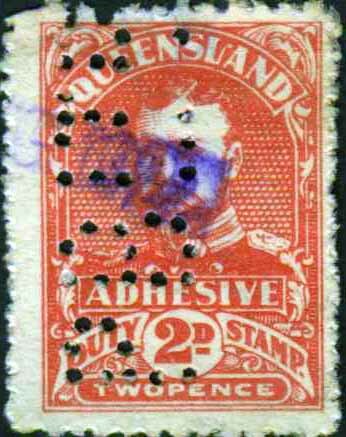 The device was located in Brisbane and is found on both Queensland revenue stamps and postage stamps of Australia between 1913 and 1925.